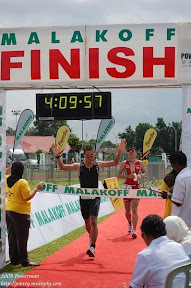 This year once again Brunei will compete The Greatest Race On Earth 2008/2009. It is a team relay marathon running in four different countries namely Nairobi-Kenya (26 Oct 2008), Singapore (7 Dec 2008), Mumbai-India (18 Jan 2009) and Hongkong (8 Feb 2009). Brunei will be represented by Othman Mustapha, Alizan Mohd Alikhan, Noor Mohd Ariffin Hj Bahrain and Sefli Ahar. All 4 runners are fully sponsored by Standard Chartered Bank Brunei. If I'm not mistaken, this is the second time Sefli Ahar had been selected to represent Brunei for this event. Last year he ran in Mumbai India in a time of 2:52:21 hours. I'm not sure about the 3 runners whether this is their first time or have been selected before. I have no record of them. Brunei Yakin..................Make Brunei Proud of you.